Now he's talking about personalized recommendations for when you don't know what to watch. 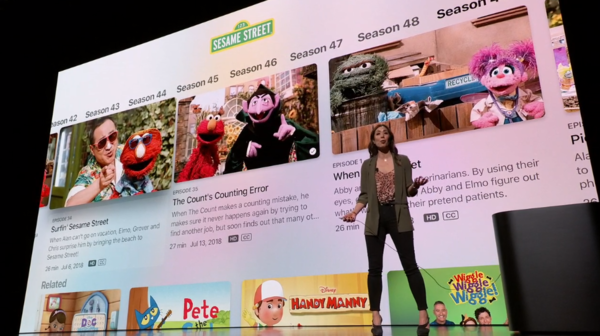 Advanced machine learning finds what you should watch based on subscriptions you already have. No more bouncing from app to app. 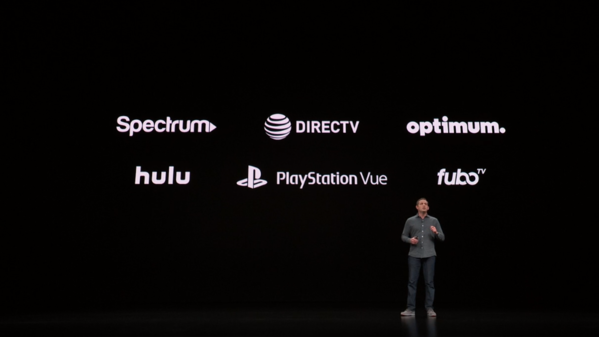 It all happens within the TV app. All your favorite movies are here. Stern shows off sports, with live scores. He brings up Cindy Lin, director of program management. She's watching the Marvelous Mrs. Maisel. 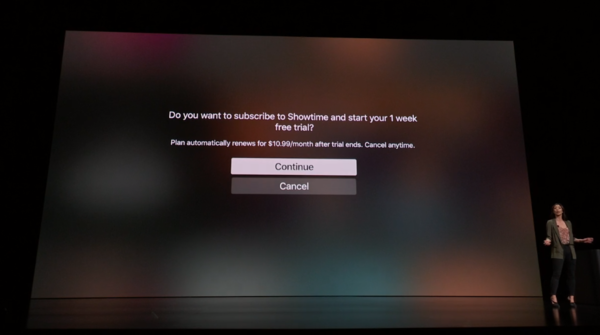 Subscribe to Showtime directly in TV app. 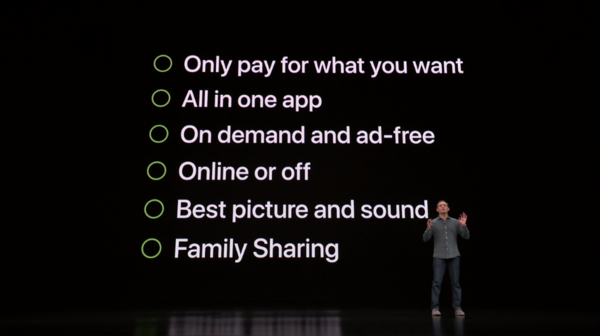 The Kids section of TV is safe, "a safe place to explore together"
The new TV app looks and sounds stunning on iPad and is amazing on iPhone. Whether you're on the way to work, or just stealing a moment for yourself. This will be available through a software update in May. 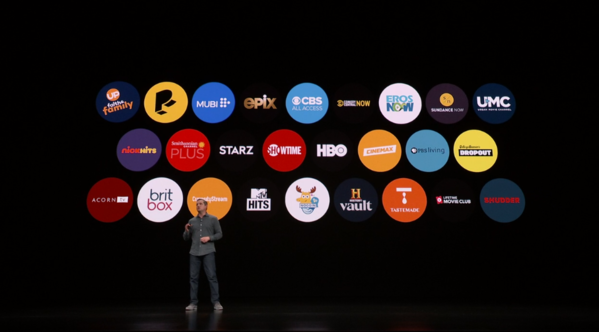 and we're bringing TV app to the Mac this fall. And that's not all - we know you're going to want this on all screens in your home. 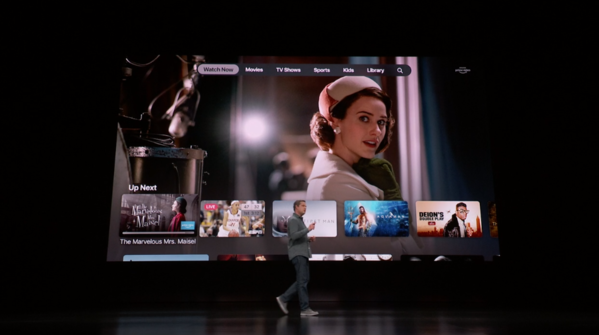 We're bringing the Apple TV app to smart tvs. 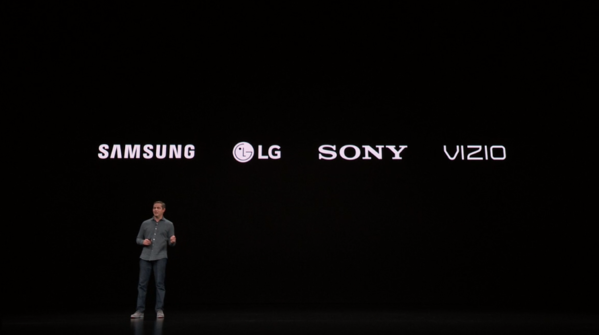 SAMSUNG, LG, SONY, VIZIO. 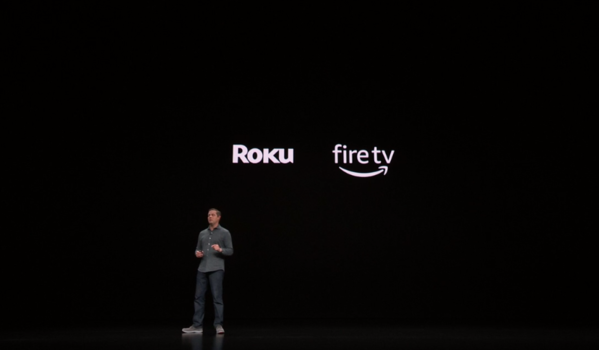 And we're bringing the Apple TV app to Roku and Amazon. Today it's available in 10 countries. We're bringing the new experience to over 100 countries. And we won't share your personal information with anyone. Tim: But we have even more to contribute to the TV experience. Apple has always tried to make the world a better place, and we believe deeply in the power of creativity, because great stories can change the world. They move and inspire us, and challenge our assumptions. We think we can contribute to culture and society through storytelling. So we partnered with the most thoughtful and accomplished group of award winning people to create a new service unlike anything that's ever been done before. 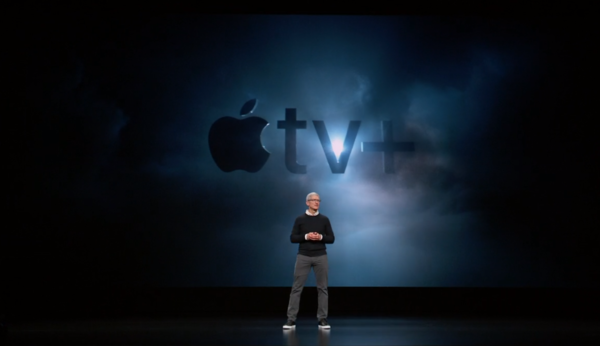 tv+. We have two amazing people running this effort for us, Zack van Amberg and Jamie Erlich. Zack and Jamie come out to talk about the new service. They talk about the power of storytelling, and bring out a few of the creatives behind the service to come out and speak. Video playing about it. Spielberg talks about how he'd open the video. Ron Howard are all in the video. 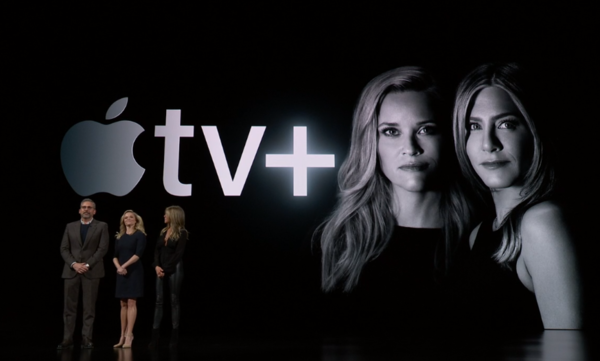 Aniston, Witherspoon, and other actresses are in the video as well. Spielberg "fear of failure is a kind of octane for me." This video is not short. It's enjoyable, but it's going on longer than any we can remember. Octavia Spencer was in the video, too. 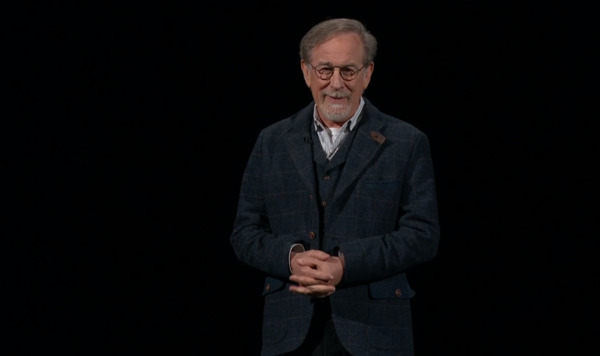 Spielberg is out on stage, talking about Apple as the place where imagination and technology change the world. He's talking about the magazine Amazing Stories. When he was a kid, his father read stories from it to him. Reese Witherspoon and Jennifer Aniston are now out. The Morning Show is about the dynamic between men and women in the high stakes environ that is the morning news show. Jennifer: "You can't have a show about the dynamics between men and women without a male"
Steve: "I am happy to provide the manliness!" Now on stage: Jason Mamoa is onstage to talk about the show See, about a world with a virus that left only a few million survivors, and everyone is blind. Evil queens, brave heroes, but beyond that, it asks the question, how much of the experience in life is visual. This man's show is about immigrants doing everyday life stuff in the US. These are human stories that feature immigrants. The show is Little America. The goal is to make a show that shows we all look for the same things. To take away the idea of people as "other" from us. It covers the full range of human emotion. The majority of the writers are either immigrants or children of immigrants. There is no such thing as the 'other', there is only 'us'. 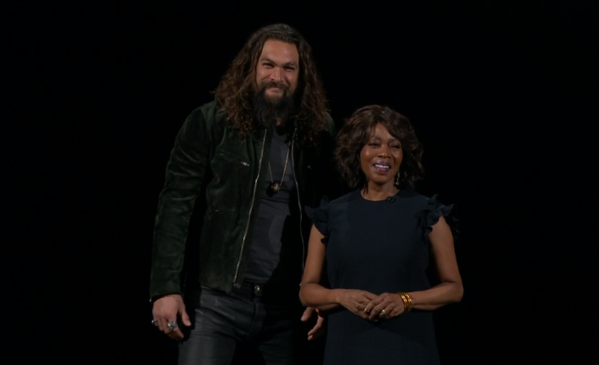 The woman with Jason Mamoa was Alfre Woodard. 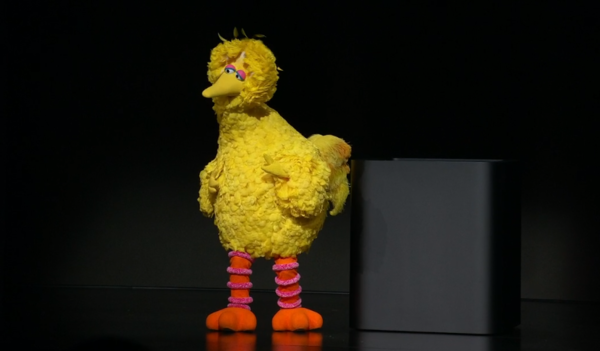 Now Big Bird from Sesame Street is out. There's going to be a Children's Television Workshop show called Helpsters that stars a muppet teaching about coding.